It's bit difficult to say how it all started, but the Bushbuddy wood-burning stove was clearly involved. Searching the web for information on Bushbuddy fuels I landed on Hendriks blog. A few comments later this blog was born and sometime later Hendrik started the discussion and all of the sudden I was involved in the Scandinavian outdoor Bloggers Meetup. 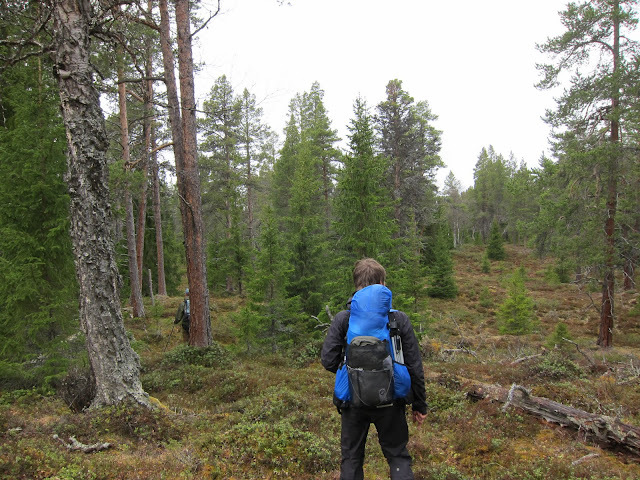 It all sounded a bit too improbable, but here I was walking briskly into the Vålådalen wilderness with a bunch of merry lightpackers. That's the positive power of Internet and Social media for you. The first kilometer I often feel a bit excited and a bit nervous, did I bring everything? are we on the right track? 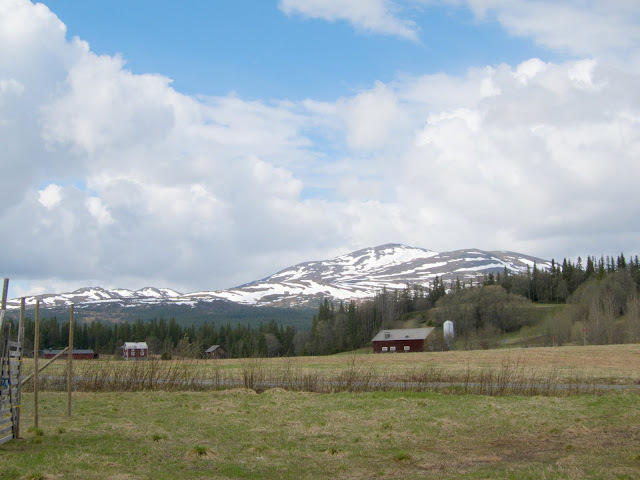 Jörgen seemed to know this area like his own pocket and I soon calmed down and started taking in the early spring landscape. Spring - the end of the beginning. In general very few flowers were in bloom. Our intended route did not really involve any difficult navigation though. In brief we would just cross Vålån south over the bridge, pass Blanktjärnarna, and then follow Vålån right up to the trail between Vålåstugorna and Lunndörrsstugorna. Then we would follow the trail past the Pyramids and Issjödalen (The ice lake valley). The last part would be through the forest past Grönvallen and end in Vallbo, a village near east Vålådalen where the sauna would await our arrival. One big obstacle worried me however, this path would require us to ford Lunndörrsån which promised to be full of water since it had been raining almost constantly the last few weeks. At first sight the stream really looked daunting, but looking closer you could see that it was not more than knee deep in any place. The current wasn't too strong either, but it sure was cold! A common dangerous beginners mistake is to try to ford at the narrowest point. 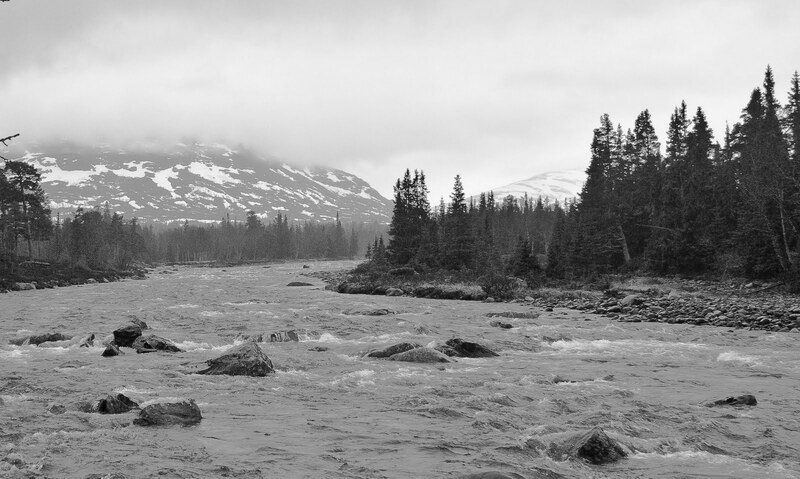 A friend of mine did this on Kebnekaise and was swept away several meters and hurt himself quite badly on the rocks. It was not a pleasant experience. With patience and good judgment as to when to turn back there is seldom much to worry about. 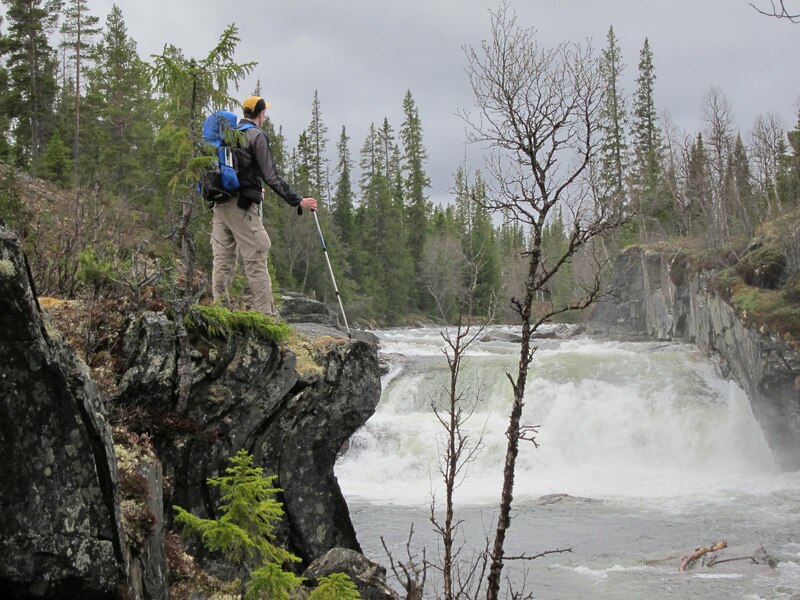 Having two trekking poles is also really great. I would never ford without at least one stick in faster water. 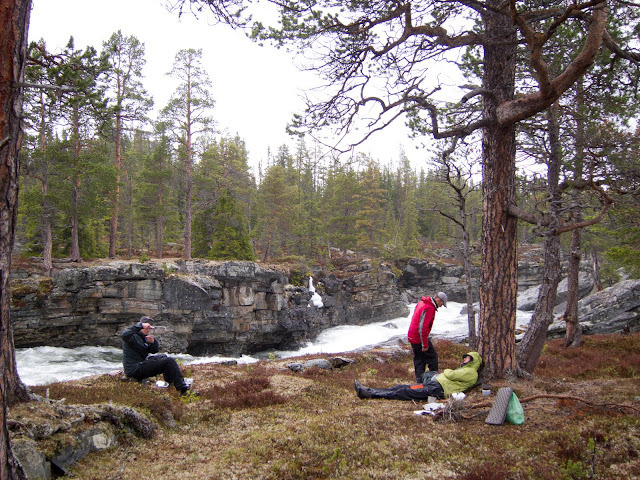 After the ford we continued through the forest to the Blanktjärnarna tarns where we had lunch. Although I'm normally quite happy being the eccentric guy with the wood-burning stove, it was very nice to share experiences and the air was soon thick with smoke from no less then three wood-burners! When it comes to food I had almost achieved my goal of not bringing any commercial freeze-dried food (I brought one bag of Knorr Spaghetteria which costs less than 2€ and I quite like it.). For the first lunch I had Ramen noodles and some gourmet Italian salami. It tasted great and was easy to prepare. Add enough salami and you should get plenty of calories too. 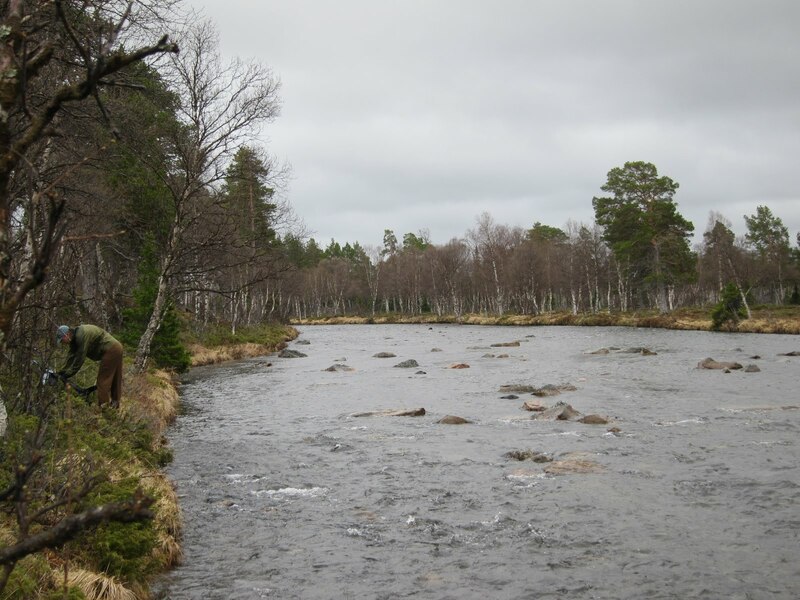 After lunch we soon reached the banks of Vålån again. I must say I had some doubts as to the scenic qualities of our mostly forest bound route, but Vålån proved to be every bit as magical as Jörgen had portrayed it when we were planning the trip. 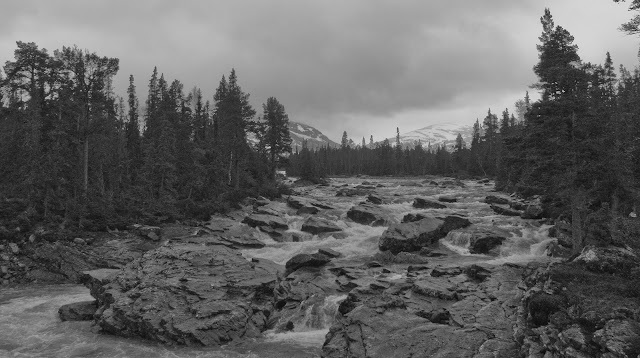 Waterfalls, rapids, old growth forest and a nice backdrop of snow covered mountains created a great feeling of wilderness. Several times I thought to myself that this scenery reminded my of pictures from Alaska. No need to long for far and distant places, world-class wilderness was right here, right now, only a nights train ride from home. Even the persistent rain that continued throughout the day couldn't wash away those happy thoughts. 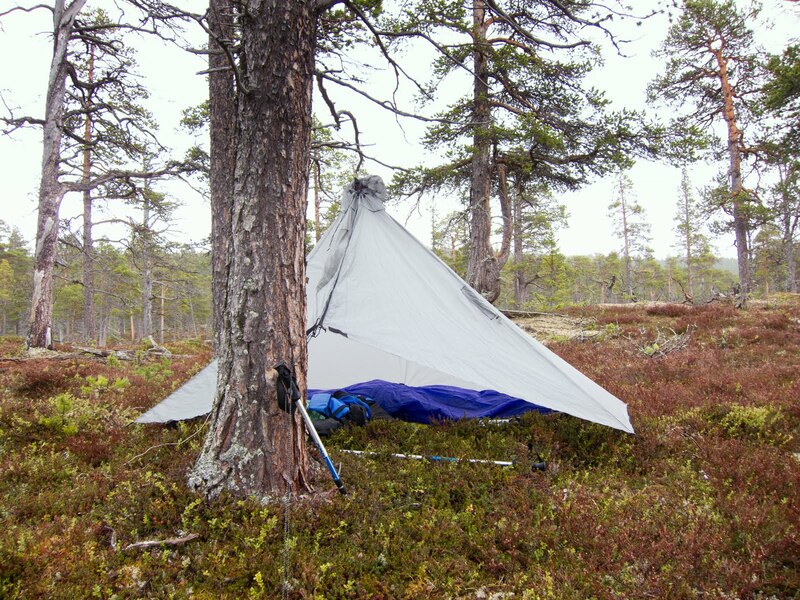 Bushwacking through the forest off-trail can be hard on ultralight gear. 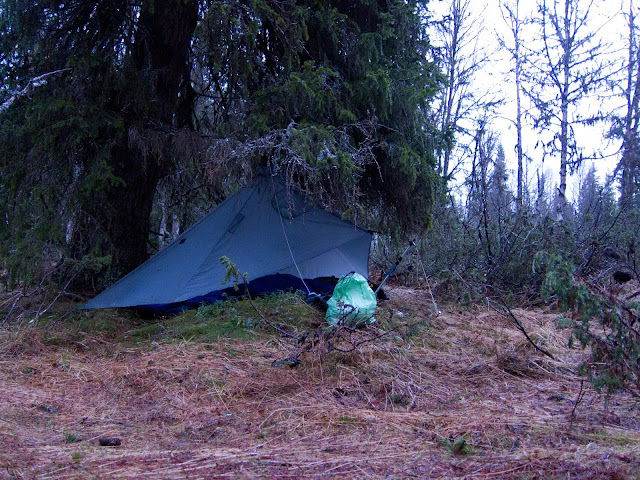 I can admit I was slightly worried that the Sil-Nylon Murmur pack Gossamer Gear lent us for the trip would be damaged when brushing against spruce boughs and pushing through willows. Luckily I didn't find any obvious signs of wear after the trip even though I made no effort to baby the pack. Switching from the Spinnaker fabric used for the previous Whisper G6 pack to 1.3oz. Sil-Nylon was a good choice I think, even though it makes the Murmur twice as heavy! I suppose most people can live with a 36l pack weighing 224g. When it was approaching dinner time we started to look around for a good campsite. There were plenty of alternatives around and we soon found a nice spot next to some rapids which provided a nice noise curtain which would later lull us to sleep. For dinner I decided to prepare my most advanced meal - Barilla cheese tortellinis with grated Parmesan cheese and a delicious piece of heavy-weight bell pepper generously donated by Martin. It tasted great, but the cheese made it hell to clean the pot afterwards. Large amounts of earth and heavy scrubbing with moss was needed. After dinner there was much fun and rejoicing around the campfire and I suspect my good sleep was not only due to the rapids, but some destilled beverages might also have been involved. Hendriks Minttu and chocolate combo was especially appreciated. I went to sleep happy and content with the day under my Gatewood Cape. The air was very humid and I felt a bit cold in the middle of the night and had to put on my down sweater. At some point I was also awoken by the sound of Ptarmigans passing through our camp. After that I slept like a baby. The next day started with some hope of the rain receding, but alas that was not to be. The campfire made for a nice, albeit slow, morning start and after awhile we were on our way again along the bank of the stream. 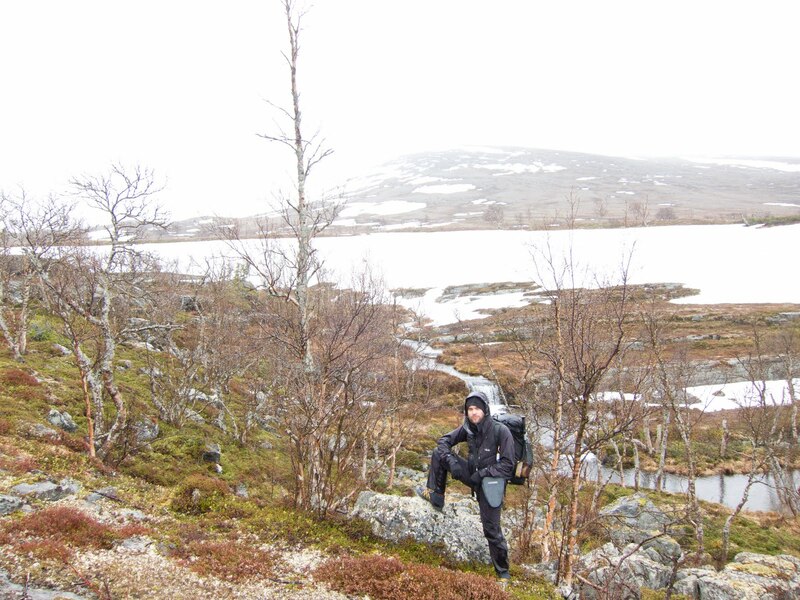 After an hour or so we started to gain altitude as we left Vålån to our west and made our way towards the trail to Lunndörrsstugan. It was nice to change views for the more open spaces above the treeline, but I must say that in bad weather the forest definitely has it's advantages. 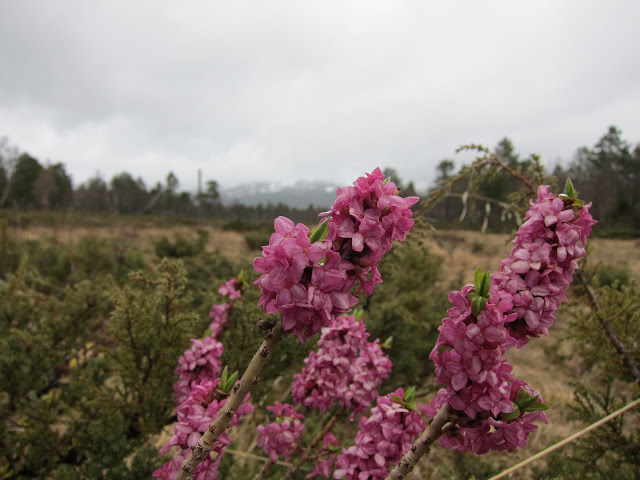 The rain had picked up again and the clouds obscured the views. When planning the trip I had a wild idea to run ahead of everybody else and do a 5km detour into the Lunndörren U-valley. In this weather it didn't seem very tempting since the cloud base was lower than the valley anyway. So we just plodded on and forded a couple of cold streams. 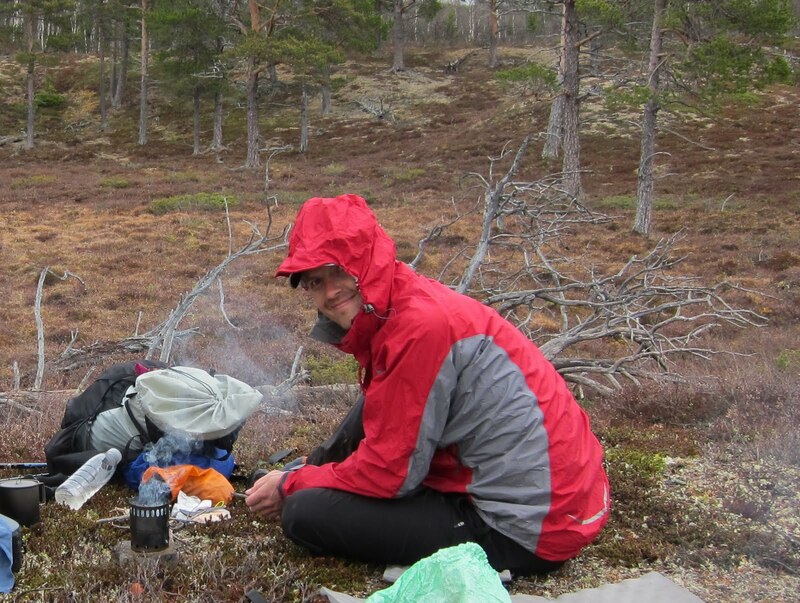 For lunch we decided to use the facilities of the Lunndörrsstugan hut so that we could be sheltered from the rain and wind for awhile. This is possible to do even off-season when the huts are not attended and you pay later by bank transfer (The price was around 5€ I think.). The hut was a bit too cosy I thought and I decided to try to prepare my lunch outside in the rain just to get some realistic training with the Bushbuddy. All the vegetation was really soaking wet, so it was a real challenge. With liberal use of birch bark, some dwarf birch branches and a dead mountain birch branch split into smaller shavings the fire actually caught on. Splitting the branch was really key in this situation. It was precisely for this case that I had brought my full size Mora knife. The water actually reached the boiling point just before my clumsy cold hands tripped everything over and the precious warm water was spilled on the ground. Clearly more training is needed. I had planned for a triumphant entry with hot food, but this time the warm hut and pleasant company was too tempting and I made a tactical retreat inside. My Ramen noodles and salami were prepared inside on the hut stove. The hut was as nice and comfy as only a welcomed warm shelter in bad weather can be. 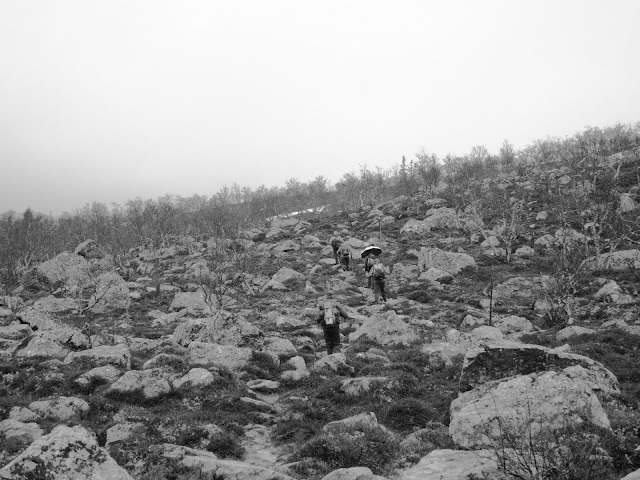 Our hardened hiker souls were exposed to the temptation of staying inside also for the night, but luckily we persevered and continued the hike towards Issjödalen. 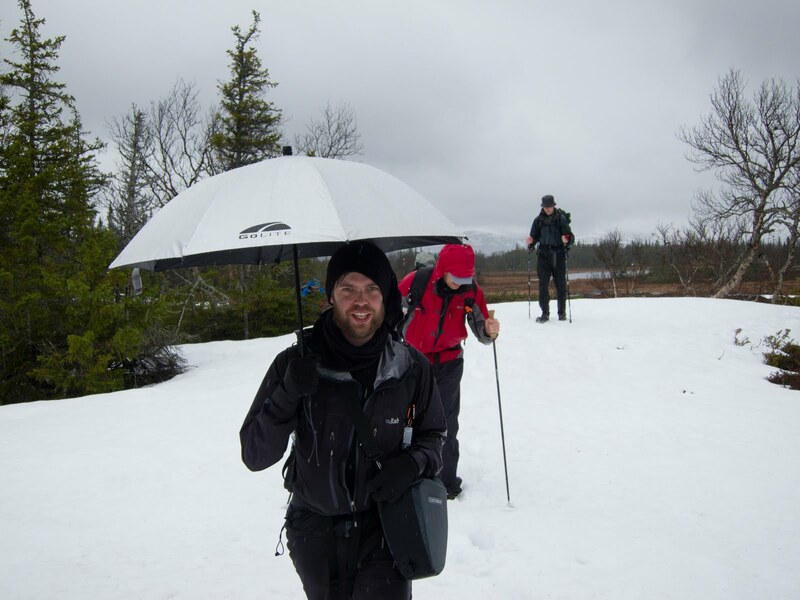 The weather stayed miserable and we had to posthole a bit across the snowfields that still blocked the trail, but nevertheless morale was high. For the first time since I started hiking with wet feet my feet actually got cold even sometime after the fording. I suspect this has to do with several factors, one being the bad weather and relatively low temperature, but also that we postponed eating dinner and I was running out of energy (despite my Runekakor snacks.). I have also been told that if your feet and hands are cold it is often because your torso is cold. Maybe I should have put on my Ullfrotté shirt which I bring exactly for this purpose. After awhile I put on my Gator fleece wet socks and then my feet got warm again pretty soon. Having passed the Pyramids we soon reached Issjödalen and the Kings hunting lodge. We considered putting up camp next to the lean-to in the valley, but it was still full of snow! After some deliberation we decided to continue walking and find some more sheltered spot in the forest. We lost the good views, but gained warmth as the forest sheltered us from the wind. Jörgen shared an old sentence that seemed apt for the situation: "The forest is the poor mans coat". For sure we could have stayed higher, but I doubt that dinner conversation would have been as long and happy as it was below the spruce branches. 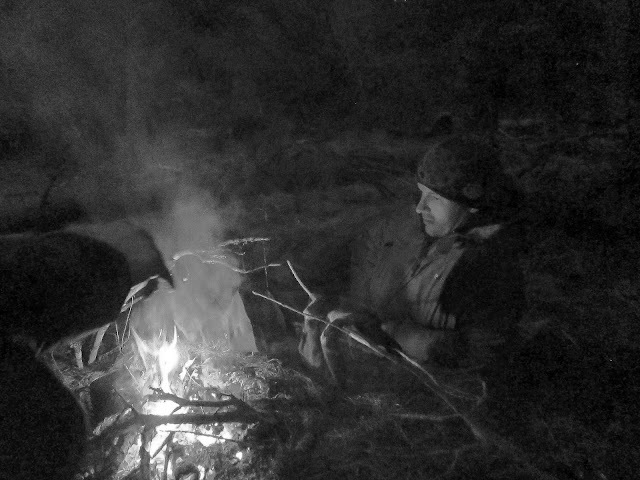 After all, chatting in front of the campfire was a goal in itself on this trip. It seemed there was not a single hiking topic you could not get an expert opinion on and there was hardly any piece of gear that had not been tested by at least one in the gang. Especially Roger of Nielsen Brown Outdoor fame was extremely well informed about all the cottage manufacturers and could provide good advice on almost all gear topics. After dinner I again retired to my Gatewood Cape castle under a large spruce. A woodcock bid as good night as it flew over with it's characteristic "phee-phee --- knorrrp knorrrp". I had a good nights sleep, although a bit hot and clammy in the morning since I chose to put on all my insulating clothing. The next morning we didn't have too many kilometers left and could walk with ease towards our finishing point in Östra Vålådalen. Near Grönvallen the path was completely flooded though so our feet got wet again right away. Soon the weather started improving and you could actually feel spring in the air for the first time during the trip. Around lunchtime the sun even started to make an appearance now and then. It was almost a surreal experience when you've had nothing but grey skies for the last two days. Resting in the sunshine after lunch was pure pleasure. Mindfulness is all the rage these days, no need to read books or take expensive courses, just go out in nature and feel the elements and you get loads of it. 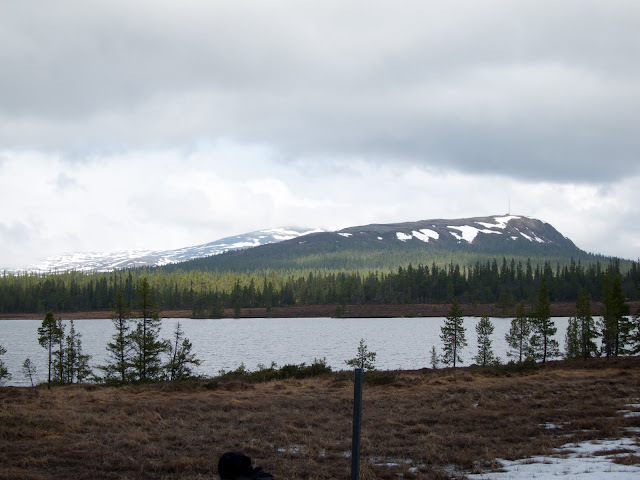 As we walked the last kilometers the weather improved even more and it was even warm. It felt a bit stupid that the nice weather would come just at the end, but better late than never. 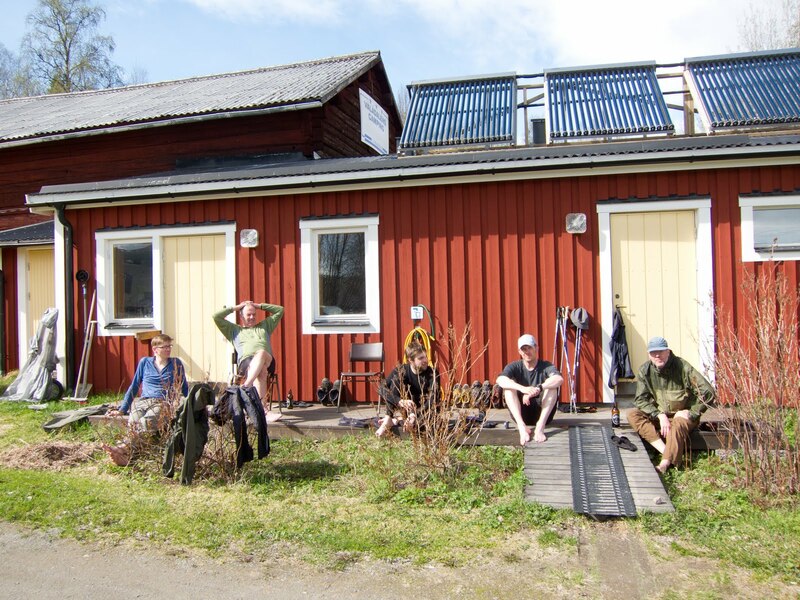 Finally we reached our goal, Vålågårdens camping. A bit too soon really as I wished the trip would not end already. The owners provided excellent service even though the camping wasn't really open yet. The sauna was warm, beer and snacks were waiting and all our stored gear was still there. The shower and sauna after the long hike was a pure pleasure. More than one beer was consumed, and sitting chatting on the porch in the sunshine was a perfect ending for a superb trip. I haven't had so much fun in years. Oh, I really enjoyed the report, Gustav! Makes me want to go on another trip with you and the guys! Very nice photos, especially the b/w ones. Takk! Just a great write up. I like the gatewood too, but bugs are a big problem where I tend to hangout and the serenity net tent seems small. The wild oasis seems like a decent compromise. Anybody had a chance to test it out? IMHO the only thing missing were the "Mordor" analogies. Great to get different perspectives on a trip you have made. Harttj - Yeah, the Lord of the rings analogy was good, but I didn't want to steal Hendriks idea. In hindsight I should probably have bought the Wild Oasis instead. I've never used the Gatewood Cape in cape mode anyway. In bug season I use a simple sea-to-summit net draped over me. It kind of works but it is cramped. Joe - It would be great to do a trip again. Maybe I will have to bring all three kids though!